TDS Telecom Archives · Stop the Cap! Phone companies can beat their cable competitors, but only if they invest in fiber upgrades that can deliver as-advertised broadband service and speed. TDS Telecom, an independent phone company based in Chicago, has reported good results from the $60 million in fiber upgrades it has committed to complete in 2018. Offers good population density where homes and business are close enough to each other to warrant the expense of wiring each for fiber service. TDS chief financial officer Vicki Villacrez made her case with investors to think positively about investments in fiber, reporting one TDS market garnered a 54% market share in broadband and took 33% of the market share for video after fiber service arrived. TDS, unlike many other independent phone companies, is not avoiding investments in delivering faster broadband speed to customers. TDS typically reinvests 75% of its revenue in network upgrades and returns the other 25% to shareholders. Outside of its landline service areas, TDS has also acquired cable companies to provide service to customers, offering gigabit speeds in many areas. 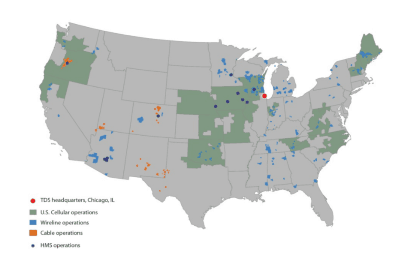 In rural areas, the company is combining federal Connect America Funds with its own money to deploy bonded DSL service in areas too unprofitable to serve with fiber. This typically delivers faster internet service than rural broadband rollouts from other phone companies like Windstream and Frontier. TDS is often the third provider in its overbuilt markets, a fact that is usually not well-received by investors because it can constrain market share and potential profits. TDS chooses its overbuild markets where incumbents have chronically underinvested in their networks, and the result is “pent-up demand” by customers, according to Villacrez. TDS’ market share is typically higher in their markets than other overbuilders. Villacrez routinely tells investors the company’s success largely depends on fiber upgrades. About 24 percent of TDS Telecom’s local landline service area now has fiber to the home service, and the company is aggressively cutting the number of customers still served by slow traditional ADSL service. 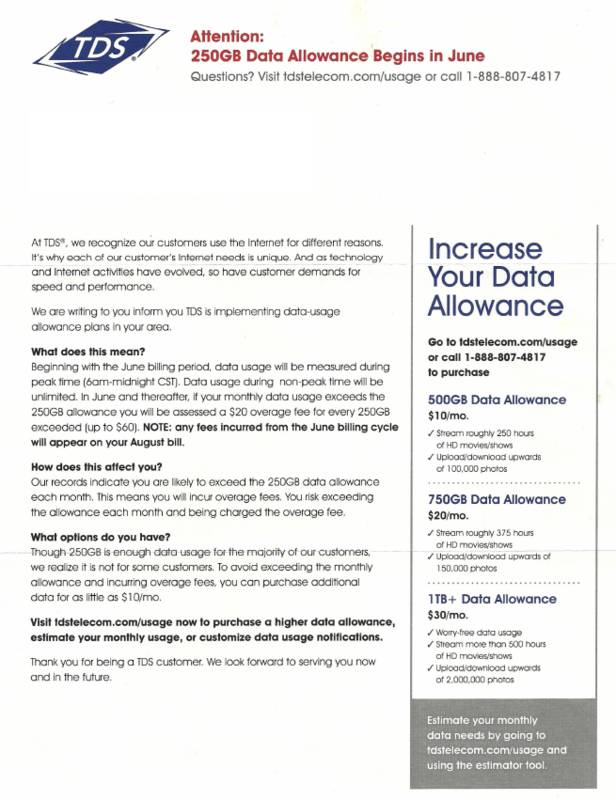 TDS DSL customers have a 250GB data cap in their future. Arch, a Stop the Cap! reader in eastern Kentucky, just received a notification letter informing him his Internet access is about to be rationed, and unless he buys additional usage before June 1, TDS is likely to charge him penalty overlimit rates. Like some data caps of the past, TDS is giving customers a small break by remaining unlimited during the overnight hours, but for many customers, it won’t be enough to prevent a higher broadband bill. TDS advises Arch that based on his prior usage, he’s very likely to exceed his cap and face overlimit fees. 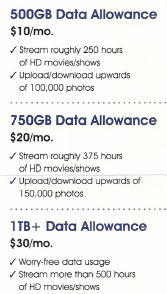 1TB (1,000GB) is priced at an additional $30 a month. TDS does not offer any justification for their data caps, but it doesn’t have a lot to fear imposing them. “TDS has no competition at all in my area except for fraudband satellite,” Arch reminds us. That is also likely true across many other TDS service areas, where the company’s 1.2 million customers live in more than 150 different communities, many rural or suburban. The town of Hollis, N.H., population 7.600, is the first community in New Hampshire to receive gigabit broadband, courtesy of the local telephone company. TDS Telecom charges less than $100 a month (when bundled with other services) for gigabit broadband speeds on the fiber to the home network TDS introduced after scrapping obsolete copper telephone wiring. The 1,000/400Mbps service is an upgrade for Hollis, which used to receive speeds up to 300Mbps. TDS bundles its Internet package with 260-channel cable television service delivered over its all-digital Mediaroom platform, and telephone service. TDS’ 1Gig Internet service includes a free subscription to Remote PC Support which provides unlimited access to technical expertise. Remote PC Support technicians help with device setup, Internet troubleshooting, plus computer optimization and safety. 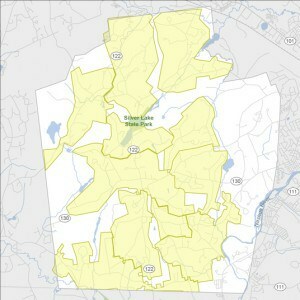 All of these areas in Hollis now have fiber service available. Customers bundling a TV package with Internet service get a $20 monthly discount off the total price of both packages. 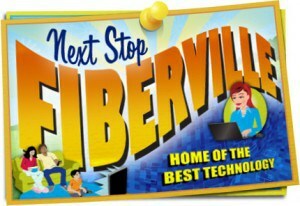 TDS’ Fiberville is already established in Hollis, but will also be forthcoming in Farragut, Tenn., and other New Hampshire communities including: Andover, Boscawen, New London, Salisbury, Springfield, Sutton, and Wilmot. Click on each community name to learn the current status of the fiber project. Customers who enroll as fiber service first becomes available get free whole-house installation and special discounts for being early adopters. Wisconsin Republicans are outraged AT&T and CenturyLink are not able to charge taxpayers and students more than double the price for broadband in schools and libraries. Wisconsin taxpayers and students could face substantially higher taxes and tuition fees because Republicans prefer AT&T and other commercial Internet Service Providers deliver high-speed Internet access to schools and libraries, even if prices are more than double those charged by the existing non-profit, cooperative provider. Last week, under growing pressure and criticism from Republican legislators and the potential threat of private litigation, the University of Wisconsin withdrew its contract with WiscNet, fearing a costly backlash that could interrupt the school’s educational and research missions. Republicans in the state legislature forced a competition ban in the 2011-2013 budget directly targeting WiscNet, an institutional broadband provider serving 300 public schools, state agencies, and 15 of 17 Wisconsin library systems. They consider WiscNet a direct competitive threat to the business interests of AT&T and other telecommunications companies. The loss of business from UW has raised questions about the ongoing viability of WiscNet’s operations, and has encouraged critics to continue the campaign against public broadband. Republicans have complained WiscNet’s close ties to the state university system and its efforts to resist the Walker Administration’s efforts to dismantle the institutional fiber network’s current operational plans border on unethical. Cheerleading the Republicans are providers including AT&T and CenturyLink, both filing their own respective complaints (AT&T) (CenturyLink). Joining them is the Wisconsin State Telecom Association (WSTA), which represents Wisconsin’s independent rural phone companies like Frontier Communications. William Esbeck, WSTA’s executive director, has been on WiscNet’s case for years. He said WiscNet’s recent victory in a procurement process to supply Internet service across the UW system was proof the bidding was rigged. “The UW simply created a ‘request for proposals’ that matched what WiscNet was already doing,” said Esbeck. Republican legislators joined Esbeck threatening hearings and unspecified repercussions for the “civil disobedience” on display by university officials attempting an end run around the Walker Administration. “There have been repeated, flagrant violations of state law — intentional deception at a level that I just am flabbergasted by, even today — and no accountability for it whatsoever,” said state Rep. Dean Knudson (R-Hudson), at a recent budget committee hearing. 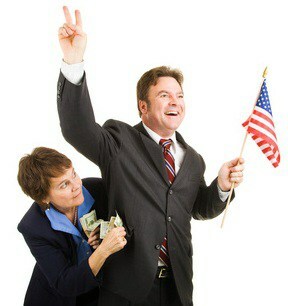 Among Knudson’s biggest campaign contributors: the WSTA and CenturyLink. In a May 23 letter sent to UW System president Kevin Reilly, state Sen. Paul Farrow (R-Pewaukee) accused UW officials of “mismanagement and unethical behavior,” saying they’d shown disdain for the legislature and contempt for the laws and directives it passed, reported Bill Lueders, the Money and Politics Project director at the Wisconsin Center for Investigative Journalism. Among Farrow’s biggest campaign donors: TDS Telecom and the WSTA. Both Farrow and Knudson are also known members of the American Legislative Exchange Council (ALEC), a corporate financed group that produces anti-public broadband draft legislation for introduction by the group’s members. Both CenturyLink and AT&T are sponsors of ALEC, AT&T in particular. The Walker Administration has given the UW System an extra six months to sever all ties with WiscNet.